I have great expectations for Second Life’s 10th birthday (“SL10B”). I’m hoping to find some inspirations to reignite my virtual spirit and propel me into a new second life. I’ve been planning on coming out of my self-imposed exile just for this event. 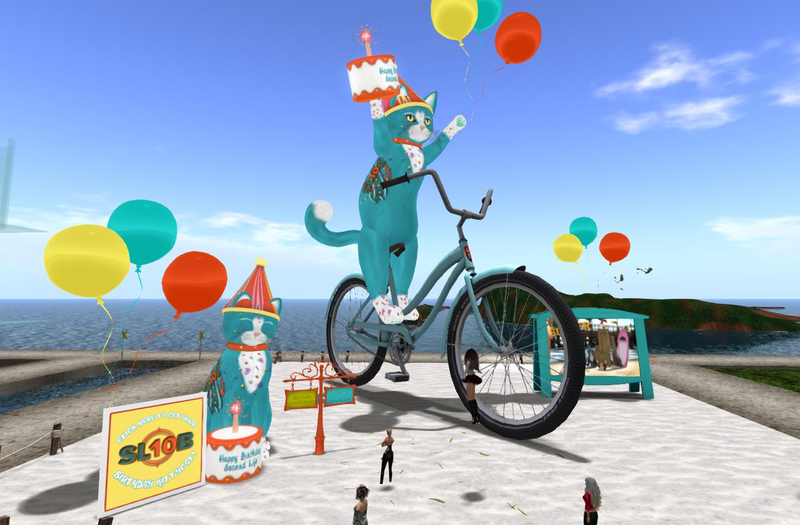 Second Life began ten years ago and that’s remarkable for many reasons. Leanna joined me and we wandered around the vast fairgrounds. The map revealed that there was somewhere in the range of 500 peeps in attendance. That’s the biggest crowd I’ve ever seen at any event in Second Life — AMAZING!! That’s LeLe and me hanging out at SL10B. The map also revealed crowds gathered for several concerts. 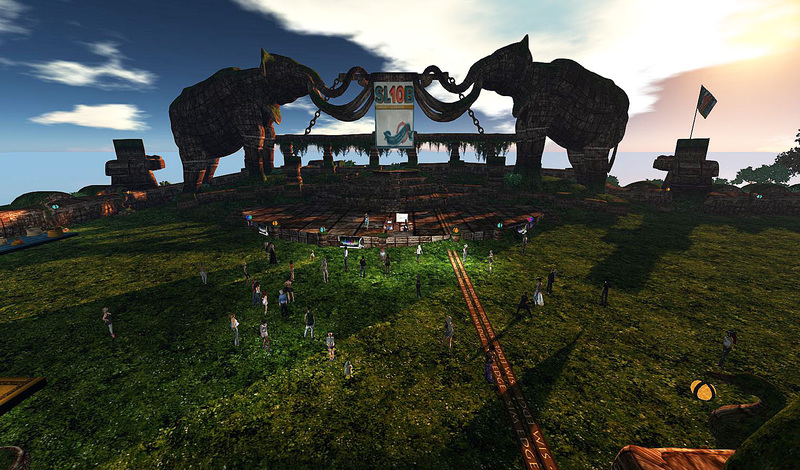 The concerts featured many of Second Life’s best performers and DJs, and each venue had back to back shows all day. This is just one of the concert venues. allowing two to four times the guests per region. It’s good to be back in Second Life. I’m planning on attending SL10B throughout the week and coming weekend. It probably sounds absurd but I’ve been avoiding connecting with people. There are 500 people roaming the lands and I’m slinking around, trying to avoid engagement. Here’s an exhibit that gave me a big smile; unmistakably Callie Cline! Regardless of my many disappointments with SL and Linden Lab, this virtual world continues to evolve and improve. I can’t say it continues to grow because I don’t see any significant growth. Still with a couple fixes and a little publicity, I believe SL can grow. This entry was posted in Events and tagged Community, Events, Exploring, Linden Lab, Second Life, SL10B. Bookmark the permalink.